You have to replace the text with actual values of your project path, package name and project name. Once executed this script will create a fresh Android project with bare bones PhoneGap application in it. We now want to replace contents of www directory with the source files of HTML5 application we have already made earlier. Have you noticed that files in this directory are similar in both projects, even if one of them is for iOS devices and another one is for Android? This is main power of hybrid mobile app frameworks like PhoneGap. 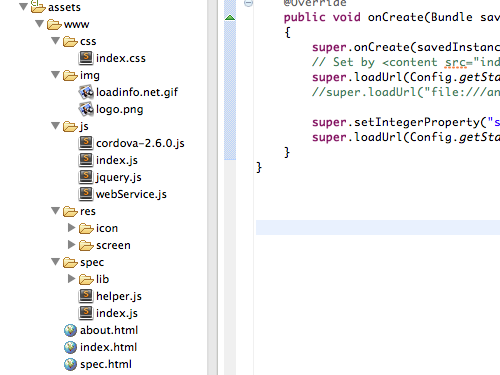 You can keep the same HTML5 code base on all your projects with some minor platform specific tweaks. Lets take a look at the main files. First, after declaring global variables and binding jQuery events for DOM elements init() function is declared. It checks where this HTML5 application is running – on our supported mobile devices or not. If not, we presume application is running in the standard web browser (its very handy for debugging application in the browser!). If we run on mobile device we have to wait till 'deviceready' is triggered by PhoneGap before performing any API calls related to the framework. Next we retrieve the last search parameter from local storage and pre filling search box for the user. We are also retrieving Geolocation coordinates and running quick query to Google Maps API to obtain location name based on longitude and latitude our app has. If user has disabled application access to the location data we will show him a notification. 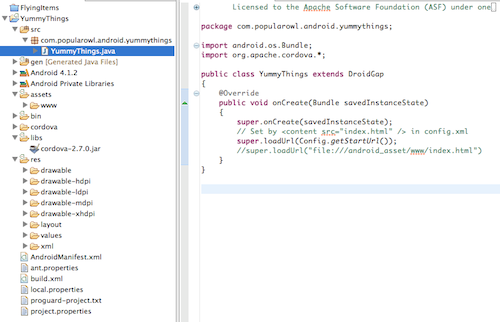 This finishes migration of our example PhoneGap iOS project to Android platform. 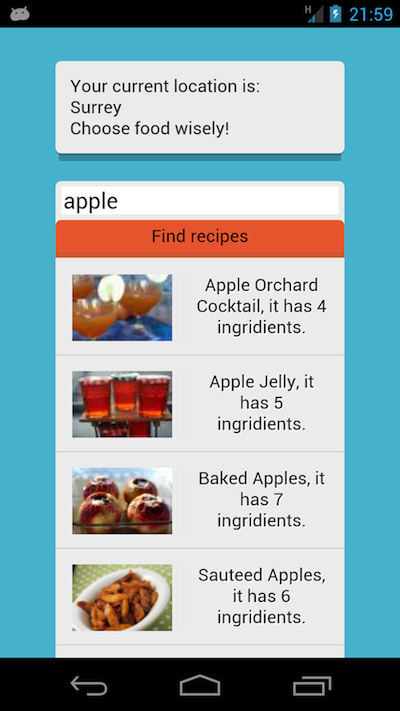 YummyThings example mobile application is now supported on both these platforms. Overall it was not very hard work to port over existing PhoneGap wraped HTML5 application to a different platform. In the real life application you probably would want to consider some specific UX element differences between platforms so application users are getting what they are used to while using their Android mobile apps. Like menu items, navigation back and accessing application settings. All these are a little bit different for each mobile OS and to have really appealing mobile application you have to make it easy for users who are used to performing tasks in specific way. As always I’m adding source code for today’s finished tutorial on GitHub. If you have any questions about the above code, leave them under this post, I’ll be happy to answer. Hi, i have a question about cordova project. If i need some HTML difference beetween Android and iOS build there is a way to have a single source or i need split the project in two single project with different file? For example i have a project that use a jquery mobile single page and i need an Android DatePicker that i don’t use with iOS, so the .js included for Android need to be different, and maybe also a little bit of html. It’s heavy manage update for two platform, the best solution is have a single source, it is possible? Its a good question as usually majority of the code for PhoneGap apps will be the same for iOS and Android but some bits will be different. It would build your files for iOS and Android apps with differences you need. And Grunt can also run tests for your mobile apps. I want to develop an app using PhoneGap with visual studio. is it possible? can i deploy it for both android and ios devices? could you please provide some link or tutorials. thanks. thanks for your tutorial Saulius. I was trying to do the same thing with Intel XDK. and same thing on index.js. it’s not working :) any suggestions? I guess whats happening is that index.php file in this example was created to look for data in responses from Yummly api. Why don’t you try pointing your application directly to this receipepuppy API instead? If receipepuppy API supports CORS you should be fine. oh I see, you mean instead of pointing the php file hosted on my server, i will just give the like to the api? Let me try and see if it’s working. Thanks. I tried this and it’s not working.